Bare root maidens or two year trees on Quince A , Quince C or Quince E rootstocks. Quince A (QA) is semi-dwarf, producing bush trees about 15 ft (4.5m) high. Requires staking. Quince C (QC) is dwarf, and produces bush trees about 4 m (13 ft) high which come into bearing slightly earlier. Requires good growing conditions and staking. Quince E (QE) is dwarf, similar quince C but is more productive and hardier. Pyrodwarf (PD) is very good new semi-vigorous rootstock, making trees about 13-16 ft (4-5m) high. 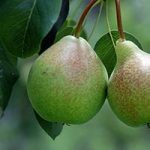 Asian pears are on Kirchensaller rootstock which is vigorous making upright trees. All the varieties below require cross pollination except Gorham, Improved Fertility & Louise Bonne; choose a variety with the same or an adjacent flower group (eg. ‘B’ in “flower group” will be pollinated by A, B or C). Details of varieties are below the table.